How to design a non land based project? I have been playing with a few ideas for designing this project but with the absence of a base map or a real tangible guide I’ve found it quite difficult. Should our design look like a world map? Considering we are travelling in a fairly linear direction this might work well. But how would we incorporate our interconnecting functions onto a map? How could we show our check ins with each other or present ourselves with creative potential? Maybe the design could be a matrix with tick boxes or something? Although this would not integrate key information so well. It needs to show how we will achieve our goals, how we are understanding our boundaries, using what resources and how have we integrated our needs. I have come up with a useful tool that I will divulge after recapping on some vital information. The most obvious thing that comes to mind in this design is the potential to stack functions. Firstly I will look again at our “How?” document to understand what action can be taken for each goal. What can we do with each idea and can we stack functions? For this goal I have chosen to start a carbon footprint document which records and calculates the carbon footprint we will have produced by the time we reach Australia. I will then compare this to flying to give ourselves an indication of whether land and sea travel really is more environmentally friendly over such a long distance. We will try to avoid flying as a number one priority. You can view the ever changing document here. Will will look to contribute specifically to regenerative projects as well as projects that enhance our skills and cultural experiences. This we will do by contacting wwoof hosts or permaculture projects that fit our goals, needs and learning potential. We will try to download and listen to audio learning books in preference to buying paper books or photocopying existing documents. Trading books with other travellers cuts down cost and provides a nice exchange environment and opportunity for social interaction. We will reduce our waste and consume less by saying no to plastic bags and packages items. Nina is keen to keep a record of our direct waste, some of which can be turned into an input by feeding animals. We will not eat meat but we realise that it will be difficult in some countries. We will buy local ethical products wherever we are able to identify their source and try to adopt a local diet. We will not buy more food that we can eat. We will resist consuming nic-naks and tacky travel memento’s. If we need to purchase items it is better to buy quality long lasting items. There are many other actions we can take to consciously develop this journey into a softly trodden one and as they become clearer from our observations we will interact accordingly. We will make a list a of our “must see places” and integrate them as much as possible. Meeting with friends and family along the way will play an important role in our need for commune and celebration. Nature and wildlife provide fun as well as wild food and walks. Our creative output provides fun and we also enjoy film, music, arts and culture and intend to maintain these interests throughout our journey. We will stay healthy by keeping warm, avoiding sunburn, drinking pure water, resting, eating well, sleeping well and limiting our toxic intake! Nina finds yoga and meditation vital to her wellbeing so decided to bring a yoga mat to practice wherever we are. This will also come in handy for rough sleeping or camping. There is actually no way to avoid learning about other cultures if you immerse yourself in them. Staying with families will probably be the most rewarding way of learning about other peoples way of life. Observing in the street is a favourite past time of mine when we are travelling and much can be learnt from that and asking plenty of questions. Other travellers, wwoof hosts and couchsurfing hosts will give us a chance to experience food, music, festivals, religion, language and habitat of other cultures. We can also inform ourselves by reading, the internet, observing and audio lessons. Our resources and those of others will provide information of benefit to us. Unlimited potential here. Linked in with earning money, exchanges, wilderness and nature, wwoofing, time with friends and family. 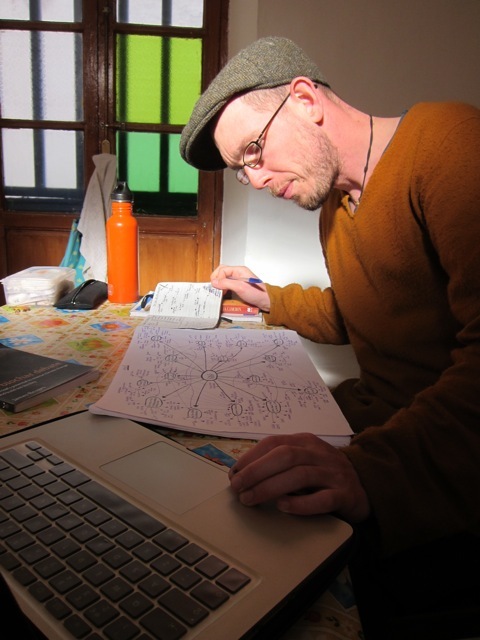 Searching the wwoof network by keywords taken from our skills flex is a way to marry the two. We can also observe, experiment and practice with other travellers and each other. There may be courses we can attend or working opportunities. 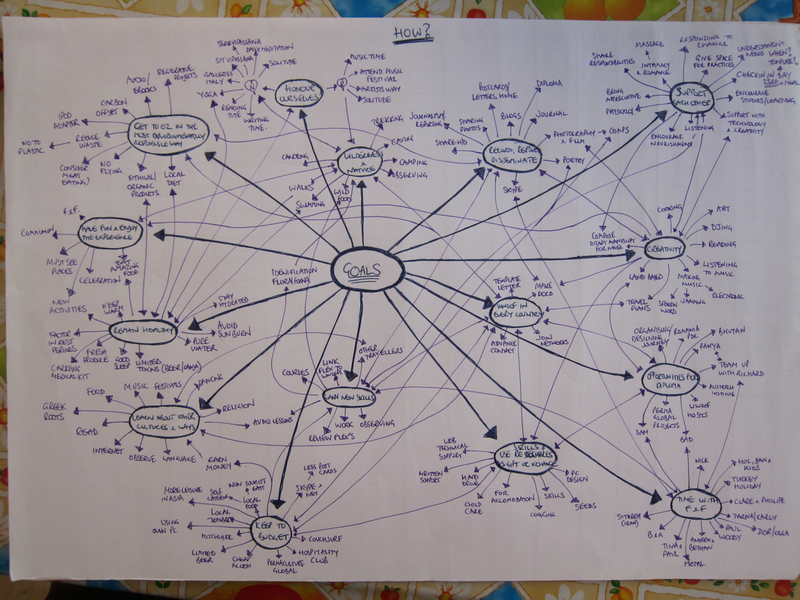 Permaculture design is the area in which I hope to experiment with integrating Wwoofing. We can also lend technical support, provide information from our databanks of music, reading resources and documentaries. We have seeds to exchange too plus all of the skills listed in our flexes. A few ideas pop up immediately here involving teaming up with Richard on his design courses as he travels on a similar route to us. Romania PDC, projects in Bhutan, Panya in Thailand, Sam, Permaculture Global all present opportunities, Wwoof hosts will be invaluable too. Land based design, blogging, Djing, cooking, dance, art and the main creative process really is about designing this journey and playing with ideas. What can we integrate into this next year? Are there any lifetime ambitions we could achieve? I could safely say at this stage that this is one of my lifetime ambitions! Nina is keen to increase her writing output and connect with other people who share her interests in film and literature. Honouring our ethic of fair share this presents the ideal opportunity to give something back to each country that accommodates us. Our time, skills and energy is a great resource that other people can benefit from as we go. This also presents us with a huge amount of scope to learn new skills, use PC design and learn about the cultures in which we are in. A video documentary of our wwoofing experience is also a goal I would like to combine. Walking, camping, canoeing, wild food gathering, working the land, observing nature, visiting national parks, caves forests. The list is endless. All of these activities will also contribute to remaining healthy and having fun. More new skills to be gained here. Blogging, journalling, video documenting and various other ways of disseminating information. We will also be writing home, skyping, sharing photo’s and stories of our culture and origin. This integrates with our ethics of people care, earth care by raising awareness on pressing issues or even creating online campaigns. More opportunities for a creative experience and cultural exchanges by wwoofing, couchsurfing and volunteering which also reduces the money we spend. Some work may be an option to earn extra pennies also. Will will eat in the cheaper, local food options or cater for ourselves, use local transport or hitch hike when feasible. We can also save money in communication by email and skype rather than phone calls. More time in cheaper countries and less time in more expensive places. We have decided to split our budget into stages of our journey which we hope will limit what we spent at the beginning of our trip so that we do not sacrifice the end of our journey. We have split it into Europe, Turkey to China and South East Asis to Australia. This will will also review regularly. We can identify our friends, families and networks in other countries in advance. Keep in contact in case they are visiting areas we are passing through or consciously organise time with them like meeting my family in Turkey for their holiday or teaming up with Richard to stack function by helping on a PDC in Romania. A way of keeping check of these would be helpful. This is a vital element for the harmony of our adventure. We have decided to do a check in with each other on the 23rd of each month to make sure one another’s needs are being met. Sharing responsibilities, listening, responding to change, encouragement with studies and learning are all really important, as are our needs for space and solitude but also intimacy and romance, wink wink. In conclusion to this process I can see once again that the mind map that we worked on gives a much clearer visualisation of how interconnected every aspect of this journey can be. It has also thrown up some ideas of immediate action that we can take. I realised that there is still something missing in this design. A way of visualising it and understanding where we fit into it, where our opportunites lie and how we integrate our needs. What we are starting to understand more and more is how the resources we have identified feed into our goals combining the fulfilment of our needs. Our journey to Australia still holds a lot of unknowns, in fact most of the trip is still to reveal itself. For this reason our design is an interactive one. It is also very important to us that it remains a spontaneous venture and for that reason we will not be carefully planning and designing every aspect of our trip at this stage. Instead we have opted for a month by month process of review and forward planning with the exception of obvious visa applications and more time consuming elements. An example of this is that three weeks before leaving Morocco we have our Spain Wwoof shortlist together and have contacted each one. The master document allows us to plot information along our week by week timeframe as and when it is gathered. It shows us when we need to check in with each other and serves as a central hub to show confirmed wwoof hosts, couchsurfs, permaculture projects along with possible friends and family time. Information stored in email accounts can gets messy, totally lost or forgotten about. Our master document allows us to plot weather conditions and climate in advance, we can use this information to plan our journey. We can keep track of our budget and make sure we are not overspending, this could highlight any needs to earn money. We will plot skills to gain from each project along our timeline. This over time will clearly identify the skills we have gained along the way. Additional sheets within our document shows wwoof hosts by country. Here we are keeping shortlists by matching skills from our flexes. We can note rejections and transfer our confirmed hosts onto our timeline. All of this information is a horizontal visualisation of our timeline. As we begin to plot skills achieved, needs met, activities undertaken and people we have shared time with we can also look vertically at how we are stacking functions as we go. cultural knowledge – presents a learning opportunity to find out more about a country prior to arrival. One of our resources are the lonely planets. Not particularly comprehensive on history but they provide a very good overview of a countries culture. patterns and habits – As we are understanding old habits and patterns more and more it provides us with opportunities to change them, pushing new and unfamiliar edges. our equipment – We believe what we are carrying to be a boundary, we’re precious of our possessions. Maybe there is an opportunity here to practice the impermanence of material possessions. our commitments – an opportunity to be spontaneous as we realise that our commitments are changeable. our fitness and health – only seen as a boundary when we are unable to do something. An area we can continue to improve on as we look for ways to get stronger. More walking, cycling or yoga. our mode of transport – we will always weigh up the best options taking into consideration, the environmental impact and cost. language and communication skills – creates opportunity to learn new languages. Turning more problems into solutions. our dietary needs – we will have to be flexible and adaptable to try local food wherever we are. A problem that benefits from the solution of new and interesting food. As nature builds in biodiversity we can look to this as guidance on this journey. Diversity in our activities and the cultures that we embrace will provide us with experience and information to better relate to foreign lands and new traditions. We will stow our money in many different places. Quite literally not putting all of our eggs in one basket. If some goes missing we will have stashes elsewhere. We are also contacting many hosts and projects of interest in each country. The chances are that not everybody is always available but the more we contact the better our chance of success. This is all about places things in the right places so that they can communicate with their surroundings. This is us. We will be putting ourselves in positions of benefit to us and our surrounding environment. I see this as quite literally putting ourselves in the best possible places to fulfil our goals. We will have clear choices as to where we can interact with our surroundings and with people most efficiently and we should choose these places based on our goals. Our journey is a slow and steady solution and acquiring skills along the way. Prime example is wwoofing once again. Learning new skills, culture and pleasure. Commune. Exchanging ideas, Benefitting from nature. Helping nurture the earth. Using PC design. We can also look at our needs to see that many can be fulfilled by the write host. Cultural capital to be gained along with skills and experience. These are all valuable yields. Compiling template letters to Wwoof hosts and Music festival organisers is an example of this. By doing a job once we can distribute to many people with little more effort.